The first weekend of April, in Fukuoka, Japan, is usually dedicated to the All Japan Championships that brings together the eight best national athletes in each weight category. An institution in the cradle of judo. The event is often taken into account for the qualification of Japanese competitors for the World Championships. For the heavyweight, the open national championship (Empress Cup for women, Zen Nihon for men) will also be taken into consideration, but for sure the results of this weekend will give a better idea of the armada that Japan will align in Tokyo for the World Championships at the end of August. Thus, most of the top competitors are present in Fukuoka this weekend. Nevertheless, neither Naohisa Takato (-60kg, reigning world champion, winner in Paris at the beginning of February), nor Funa Tonaki (-48kg, world champion in 2017, winner of the Osaka and Düsseldorf Grand Slams this season) are present due to injury. Abe Uta and Arai Chizuru are not competing either as they are already selected for the worlds. Indeed, world champions in -52kg and -70kg in Baku, both women won the Osaka Grand Slam a few months later and according to a rule enacted by the Japanese selection committee in September 2017: victory in the World + victory in the Grand Slam of Japan = automatic selection for the following World. The first day of competition was dedicated to the heavy categories. Wakana Koga finished 2nd in the Kodokan Cup last November when she was only 16. Her only international competition this season so far was at the junior tournament in Aix-en-Provence at the end of last year, where she won. On Sunday, she was simply the strongest and won all her matches, including the one against Tamami Yamazaki (5th in the Russian Grand Slam not long ago) in the final with an o-uchi-gari counter for ippon. With Sana Yoshida (younger sister of Tsukasa, same age as Wakana Koga and already vice-world junior champion 2018, only beaten by Daria Bilodid in the final) Japan already has two very strong prospects for Paris 2024. In the absence of Uta Abe, the victory was promised to Natsumi Tsunoda (2nd in Osaka and Paris, winner of the Master) or Ai Shishime (vice-world champion, winner in Paris). It was finally Tsunoda who won a category that could be doubled for the World Championships, given the results this season. With this victory, Tsunoda took an option to be the other Japanese -52kg, with the world champion Abe. In this category, things are clear: Tsukasa Yoshida has been the boss since the beginning of the Olympic cycle. Silver medallist at the world championships in 2017, world champion in 2018, winner of the Masters and Düsseldorf this season, her selection was almost sure. Her victory today against No. 2 in the category, Momo Tamaoki (2nd in Osaka, 3rd in the Master and Paris) on a sode-tsuri-komi-goshi, reinforces the legitimacy of the national leadership of Yoshida. Victorious at the Düsseldorf Grand Slam and already triple world medallist, Miku Tashiro scored points in her duel with Nami Nabekura (3rd in Paris, 2nd at the World Masters, where she was defeated in the final by Clarisse Agbegnenou of France). The two women met in the final and it is the first who won on sumi-otoshi for waza-ari, offering her the ticket to the worlds. With the absence of Arai, the final victory was to go to No. 2 and 3 in the category, namely Yoko Ono and Saki Niizoe. It is the bronze medalist in Baku in 2018 who won against her younger opponent on a ko-soto-gari counter for waza-ari. Ono remains on a win in Paris. With this victory, a second world selection seems possible for her but for the moment, it is Arai who obtained the precious spot on the Japanese team. 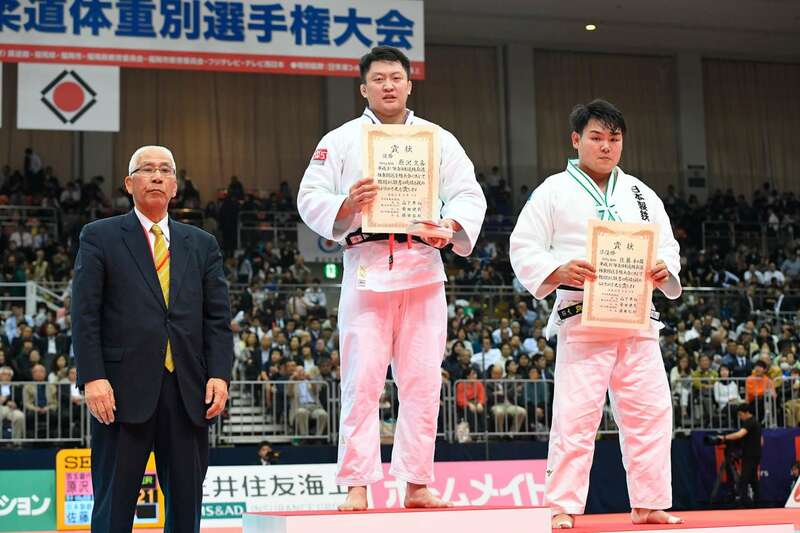 Third in Osaka and at the World Master at the end of December, Shori Hamada won in Fukuoka ahead of Ruika Sato (5th in Paris, 2nd at the Masters) on o-uchi-gari. This was a decisive victory for the selection, especially since Hamada is still ... reigning world champion. 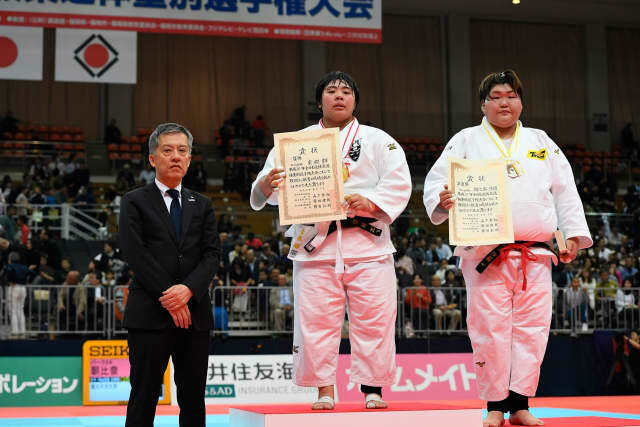 In the heavyweight division, the national leadership came down to a duel between Sarah Asahina, reigning world champion, 3rd in Osaka and 2nd in Düsseldorf and Akira Sone, now a student at IPU University (the one driven by legend Toshihiko Koga), 2nd in Osaka, 1st in the Master, 3rd in Paris, all as she is only 18 years old. 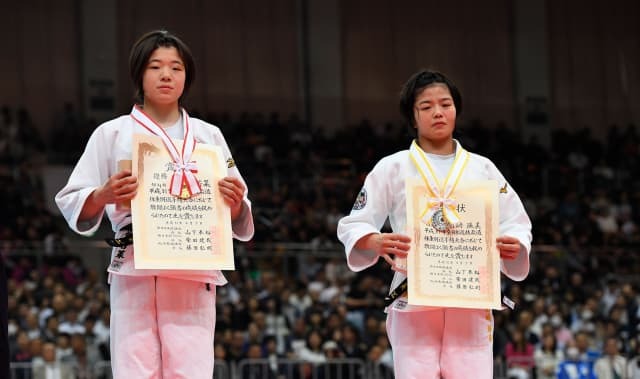 Once again, it is the youngest one who defeated her oldest opponent on a ko-soto-gari during the golden score. One will have to wait until the Empress Cup to have the final decision of the selection committee, but knowing the level of those two athletes, it wouldn't be surprising to see Akira Sone and Sarah Asahina competing at the Worlds. Injured, Naohisa Takato was not on the tatami in Fukuoka. As a consequence, his "kohai" (junior) at Tokai University, Ryuju Nagayama took his chance to strengthen his position of No. 1. An athlete who has lost only one international contest since the Tokyo Grand Slam at the end of 2017. This was against Naohisa Takato, in the semifinals of the world championships in Baku. This season, it's already three gold medals at the international level for Nagayama: the Grand Slams of Japan and Germany and the Master. In the final, Nagayama defeated Toru Shishime with ippon. It is an incredible match that Hifumi Abe and Joshiro Maruyama delivered in the final of -66kg. A terrific battle of 13'23! The start of the match was to the advantage of double world champion 2017 and 2018, Abe Hifumi. Less active, his opponent was penalized, before he gradually came back. It is in the ninth minute of the golden score that Maruyama launched the same floating tomoe-nage that he applied in the final of the Grand Slam of Osaka against Abe ... for the same result, a Waza-ari and a new victory this season for Maruyama. The long-awaited clash between Soichi Hashimoto, World Champion 2017, 2018 Vice World Champion, winner in Paris and Shohei Ono, Olympic champion, winner of Osaka and Düsseldorf this season, undefeated at the international level since the end of 2014, has finally taken place. 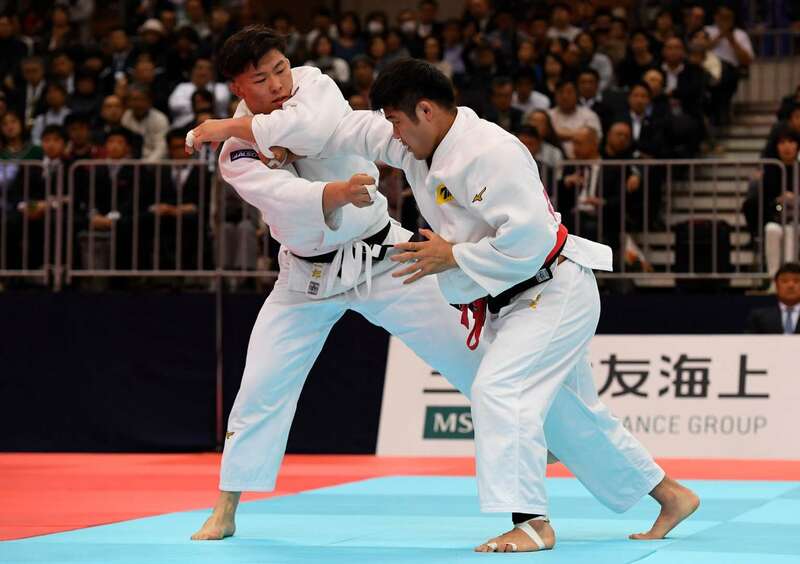 Not that it was the first confrontation between the two men, but the recent performances of Hashimoto came to question whether Shohei Ono would be able to qualify for the next global events. The answer to this question is, of course, not yet definitive. However, the victory of Ono in this championship, especially against his most serious rival, put him in a good position to look for a second Olympic title in 2020. After breaking his cruciate ligaments at the 2017 world championships, Takanori Nagase, world medalist in Rio and 2015 world champion saw two young athletes occupy the vacant place: Sotaro Fujiwara (2018 vice-world champion) and Takeshi Sasaki, winner of the Osaka Grand Slam and Master this season. Back on the international circuit at the Osaka Grand (where he finished 3rd), then 2nd in Ekaterinburg, Nagase clearly shows a rise in power since he won on Sunday against Seidai Sato with a hiza-guruma in golden score in the final. In the semifinals, he defeated Sotaro Fujiwara with a sumi-otoshi. Yet it is the latter who is selected for the world championships. This is a category without a clear leader in Japan since Mashu Baker's Olympic consecration. 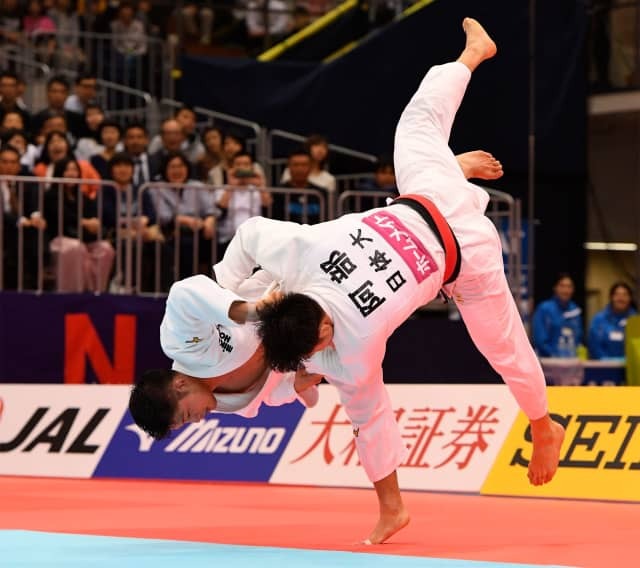 The current Olympic champion being out of the race this season because of a thigh injury in early February, the All Japan Championship represents a major step for at least three athletes on the way to Tokyo 2019: Shoichiro Mukai, Sanshiro Murao and Kenta Nagasawa. Mukai won the Osaka Grand Slam, but finished only 5th in Paris. Murao, only 18, was 3rd in Osaka, 2nd in Düsseldorf, and is also a world silver medallist in 2018. Nagasawa, who finished with a bronze medal in Baku last September, and 3rd again in Paris is often close to the podium but rarely wins. On the first day of the All Japan Championships, it is finally Mukai who defeated Nagasawa with penalties. According to the overall results, Sanshiro Murao seems to lead the selection process but this victory of Mukai changed everything. It's the surprise of the day. Many were waiting for a duel between Aaron Wolf (2017 world champion, winner in Osaka and 2nd in Paris this season) and Kentaro Iida, from Kokushikan University, winner of the German Grand Slam a few weeks ago. However, Ryonosuke Haga, bronze medallist at the Rio Olympics, surprised everyone by defeating Iida with a uchi-mata in the golden score and Wolf in the final. With this victory Haga could be the one on the tatami this summer in Tokyo. Not sure though, since he was beaten in Ekaterinburg, for his only international outing this season ... but that was by the Russian Adamian, future winner of the competition. If by any chance, Haga performs well at the Zen Nihon, he could get his ticket to the worlds. But for the moment it is Wolf who has the guaranty to be part of the Japanese selection. The leader of the category in Japan is Hisayohi Harasawa, without any doubt. After a difficult season in 2017, just after his silver medal at the Rio Olympics, the former captain of Nichidai University is fit again. He won a silver medal in Paris and the gold in Germany. On Saturday, he he confirmed his leading position by winning against an athlete, who is little known at the international level, but who is rising in the Archipelago, Kazuya Sato (from the same university as Harasawa). The Olympic silver medallist won by penalties. At the end of the All Japan Championships, the federation revealed their selection for the World Championships. Only four names are missing and only the heavyweights, men and women, are not known yet, plus two names in the women's divisions. As it was earlier explained, the Open Championships will be the determining event.